Low, dense clouds blanketed the area. Periods of precipitation ranged from light mist to light rain, but I wanted to get some birding in before the forecasted afternoon rain arrived, and was expected to last until Monday morning. My rain cover for my camera gear got a good workout as it kept getting put on and taken off all through my hike. 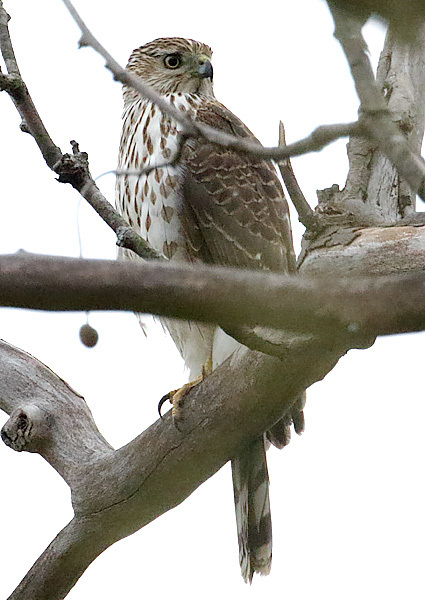 I started off at Western Park at 8:50, and right off the bat, got good looks at a juvenile Cooper's Hawk. 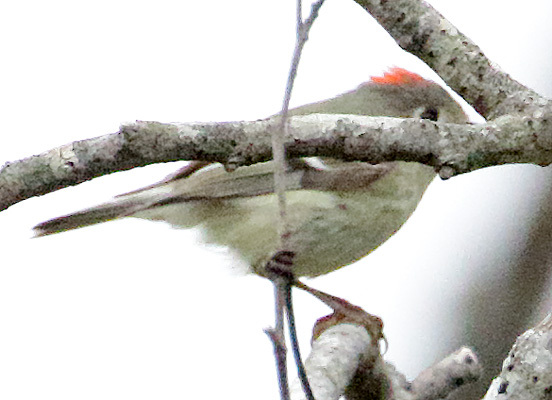 I continued hiking in Western Park, and before I headed off to my next stop in Old Trail, I had 30 avian species! 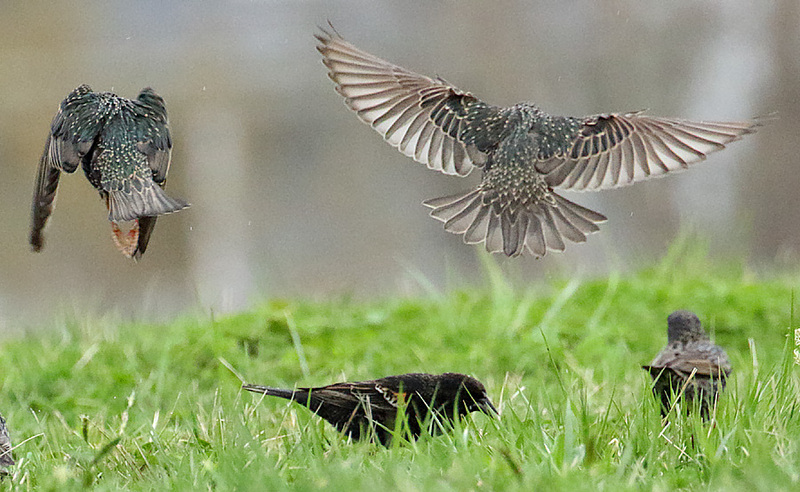 On the raised and flat plateau in the park, there was a mix of Starlings and Red-winged Blackbirds. 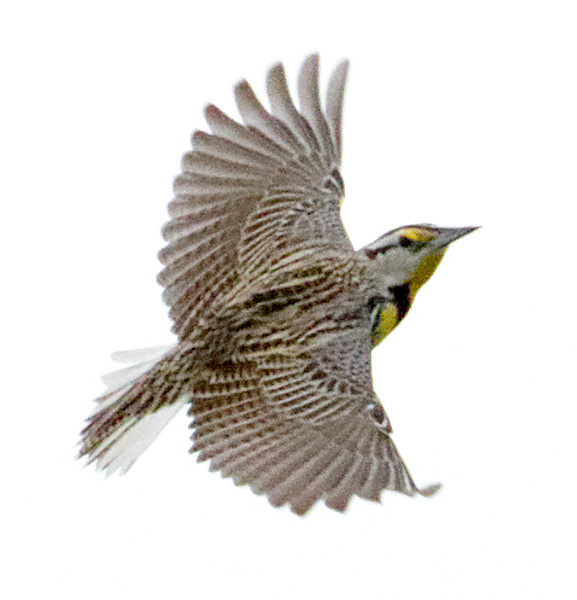 But there were also a few Eastern Meadowlarks. 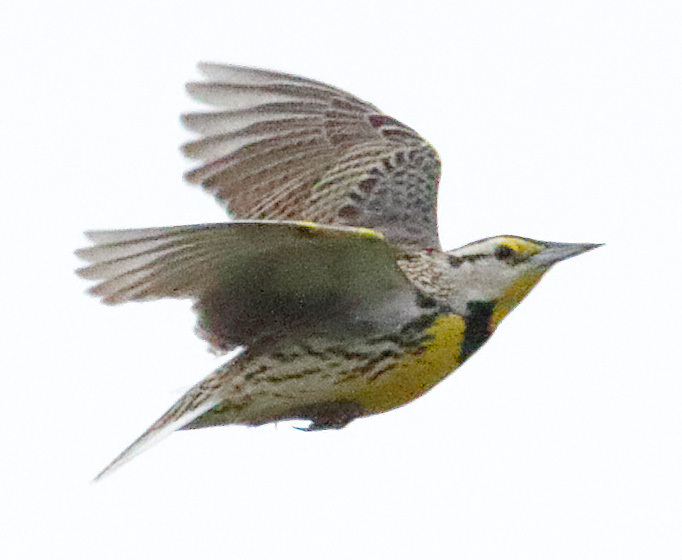 Meadowlarks are common in the farm lands of central Virginia, but I don't see them very often in Old Trail. I continued down to the soccer field in the park, adding more species to my morning hike. A Red-shouldered Hawk and a Canada Goose flew by. Near the northeast end of the soccer field, there's a small bridge that crosses Lickinghole Creek. Albemarle County is repairing that bridge, and it is closed to the public. But there weren't any workmen there early this morning, but quite a few birds, so I hiked to the barrier blocking the bridge. I saw a Ruby-crowned Kinglet, some Blue Jays, Cardinals, Robins, Red-winged Blackbirds, and heard, but could not locate, my first of year White-eyed Vireo. 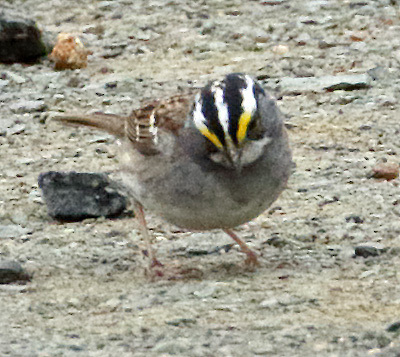 I also saw a small flock of sparrows, and in the poor light under heavy cloud cover, thought they were Field Sparrows, as I saw complete, white eye-rings, and had already photographed singing Field Sparrows earlier this morning. 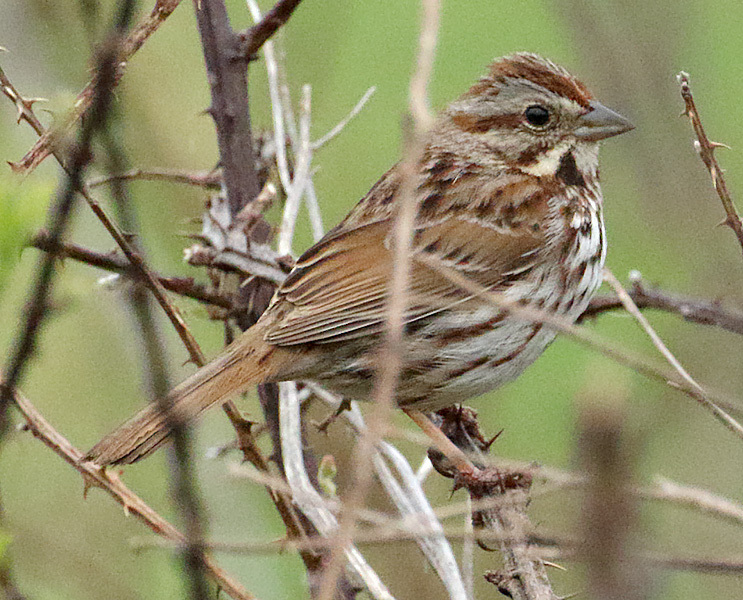 When I got home and started processing the photos, I saw that the "Field Sparrows" by the bridge were actually Grasshopper Sparrows (my Old Trail species # 135). 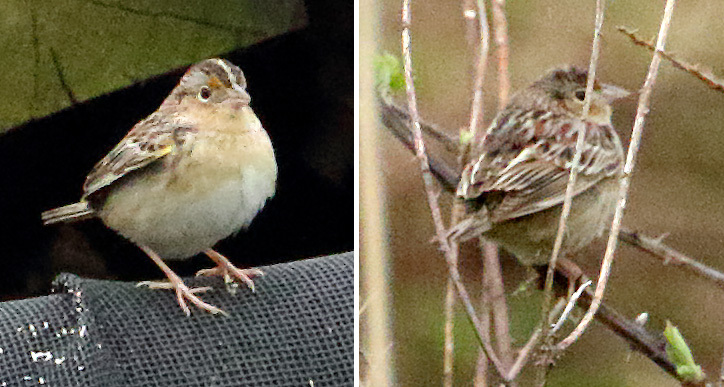 The expected arrival date for both Grasshopper Sparrow and White-eyed Vireo is April 15, so both of these species are a few days early. I headed over to the golf course pond, saw a few more species that I had seen already this morning, and hiked past the pond and up the hill. 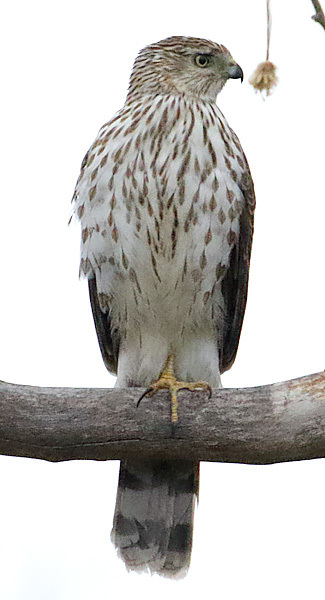 I saw a distant Red-shouldered Hawk circling above the golf course. 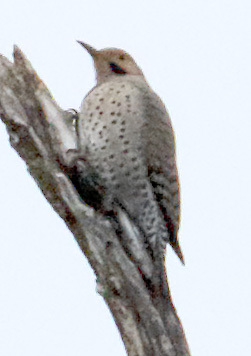 Then I heard another Red-shouldered Hawk calling. It was flying low, and heading right where I was standing. 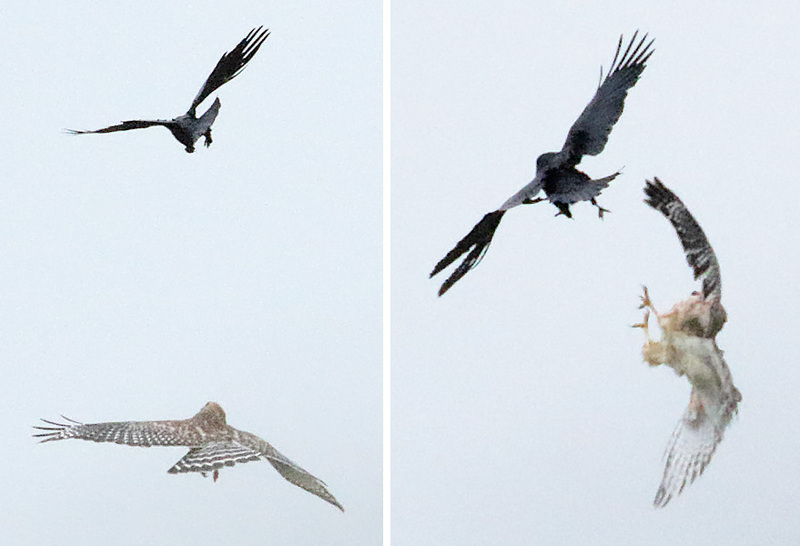 It came by so quickly that I couldn't focus my camera on it until it had passed me, and it was being chased by a crow. Well, that was exciting! 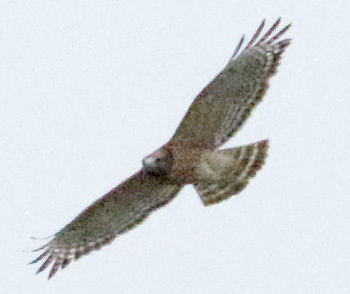 I looked up and saw a distant bird circling high above, and thought it was the first Red-shouldered Hawk. But when I focused my camera on it, the shape was wrong. 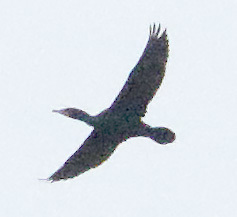 It was a Double-crested Cormorant (my Old Trail species # 136)! At 10:15, then rain started to get a lot heavier, and I had to end my morning hike. I had already logged 32 avian species here in Old Trail this morning, and was missing a dozen or so other species that I have seen here the past few days.